LG describes the HLB54S as a super slim Blu-ray soundbar with a wireless subwoofer. That 'slim' adjective only applies to the sides of the soundbar, not its middle, which protrudes further than Beyoncé's backside. Be warned that because of the protruding rump and its flush-sited sockets, the HLB54S can't be wall mounted. 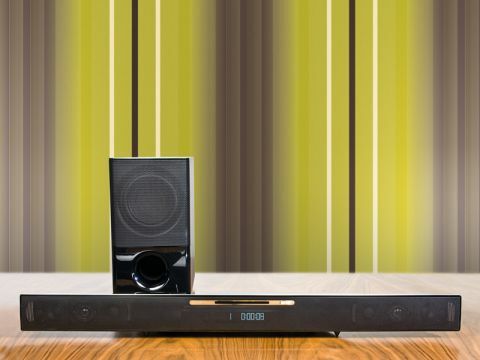 Aesthetically, the soundbar is pleasing enough and a good match for any black gloss TV, while the separate active subwoofer can be squirrelled away behind the sofa courtesy of wireless connectivity. The Wi-Fi wizardry extends to DLNA compliance that lets you stream pictures, music and videos from a PC or mobile phone to the soundbar. Traditional cable-based connectivity includes inputs for Ethernet, digital optical audio, mini-jack audio and a front-mounted USB for playing media files. Dual HDMI inputs and one output confirm the useful presence of video switching, while a composite video output seems distinctly out of place. An FM aerial socket and iPod connector for the supplied dock complete an impressive specification. Behind the grille is 280W of front and 'rear' speaker power, whilst a 150W sub suggests plenty of LFE grunt. LG's AV products are usually simple to set up and use. The HLB54S's menu layout and combination of modern fonts and graphical icons is hard to fault for user-friendliness. Connecting to my broadband router involved no more effort than inserting the Ethernet cable in to the soundbar, although the wireless sub did need manually pairing. More worrying was that the iPod dock took three attempts to recognise my iPod Touch and then had the gall to tell me to switch the TV connection from HDMI to composite video. The result was akin to smearing vaseline over my Panasonic TV's screen. Other problems arise with USB media files. While the HLB54S was flaky with JPEGs and MP3s, it nonetheless happily played some MP4 and MPEG movie files, which look excellent using the HDMI. The dedicated YouTube portal works flawlessly and the HLB54S does a fine job loading and playing Blu-ray and DVD movies, visually at least. With District 9 on Blu-ray, human skin tones look natural, while every nuance and detail of the gungy-skinned alien prawns is rendered beautifully. Sadly, audio performance is a disappointment by current soundbar standards, despite fine-tuning by audio guru Mark Levinson. The main unit's limited dynamic range means you get none of the expected improvement in power or clarity, especially at high volumes where you expect it most. The various DSP modes seem well suited to their genres but the Bypass mode is ineffective and does little to boost the overall impact. Too much is expected of the subwoofer, which lacks subtlety, and tends to swamp the higher frequencies. So, while I applaud the HLB54S's video skills, usability and feature set, it's let down by mediocre sonics.